WINDHAM — After being vacant for six years, former Windham First Selectman Jean de Smet appointed two co-town historians to preserve and share their knowledge about the town. I have added this article to my file of amusing pedagogical examples of faulty agreement and misplaced clauses. Here are two of my favorites from that file, one from the UConn Daily Campus and another from the Chronicle. Last week was tough for Shakespeare scholars who wear tweed jackets with leather elbow patches and sip sherry in the faculty lounge. You know, the people otherwise known as Saab drivers. That’s from a Friday WSJ piece on GM’s attempt to dump its Saab subsidiary. Readers outside the US may not get the joke. Trust me, it’s funny. Bonus: That same issue of the Journal also contained a strange piece by John Cassidy praising Pigou, on the grounds that Pigou’s analysis of externalities gives us unique insight into the financial crisis. “Thus, for example, a blow-up in a relatively obscure part of the credit markets—the subprime mortgage industry—can undermine the entire banking system, which, in turn, can drag the entire economy into a recession, as banks refuse to lend.” Um, duh. “Externalities” are ubiquitous, and the idea of the general interdependence of markets has been discussed since, well, Bastiat, if not the Scholastics. Certainly Pigou didn’t offer any special insight into the interdependencies across financial markets or between financial markets and product markets. Writes Cassidy: “Economics textbooks have long contained sections on how free markets fail to deal with negative spillovers such as pollution, traffic congestion and the like. Since August 2007, however, we have learned that negative spillovers occur in other sectors of the economy, especially banking.” Since August 2007? Gee, before that, we all thought banking was an isolated sector of the economy with no connection to anything. The special issue features seven papers on corporate governance that were presented in a meeting of the NBER’s corporate governance project. 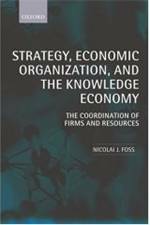 Each of the papers represents state-of-the-art research in an important area of corporate governance research. For each of these areas, we discuss the importance of the area and the questions it focuses on, how the paper in the special issue makes a significant contribution to this area, and what we do and do not know about the area. We discuss in turn work on shareholders and shareholder activism, directors, executives and their compensation, controlling shareholders, comparative corporate governance, cross-border investments in global capital markets, and the political economy of corporate governance. Here it is on the NBER site; I couldn’t find an ungated version. On a more serious note, here’s a conference celebrating the 50th anniversary of Coase’s landmark 1959 and 1960 papers, with an all-star lineup. My last post implicitly lauds the science reporting of the New York Times. And I think they generally do a good job. But, still basking in the glow of UConn’s remarkable football win over Notre Dame on Saturday, I am reminded of a — presumably unintentionally — funny bit of science reporting recently in the Times. Reporter Alan Schwartz has been waging a (perhaps justified) campaign about the problem of head-injury risk in football. In one article last month, he quotes a neurosurgeon on the physics of football collisions. When I was in high school, the assistant football coach was also the physics teacher. He tried to psych us up for one game against (as always) a bigger and more talented opponent by quoting the correct version of the mechanics of collision — energy goes up as the square of your velocity, not the square of the speed of light. How fast you get going, he was telling us, is much more important than the weight of the opponent. I found this a refreshing change from the usual cliché about the manner in which the opposing players were likely to don their athletic supporters. But under the circumstances, and especially as I was one of the few who had any idea what he was talking about, I declined to point out that smacking into another football player is an inelastic collision, so energy isn’t conserved. Momentum is always conserved, but that’s linear in both mass and velocity. I didn’t play football very seriously or for very long, but I am happy to blame the experience for my increasing mental lapses as I grow older. Extra point. 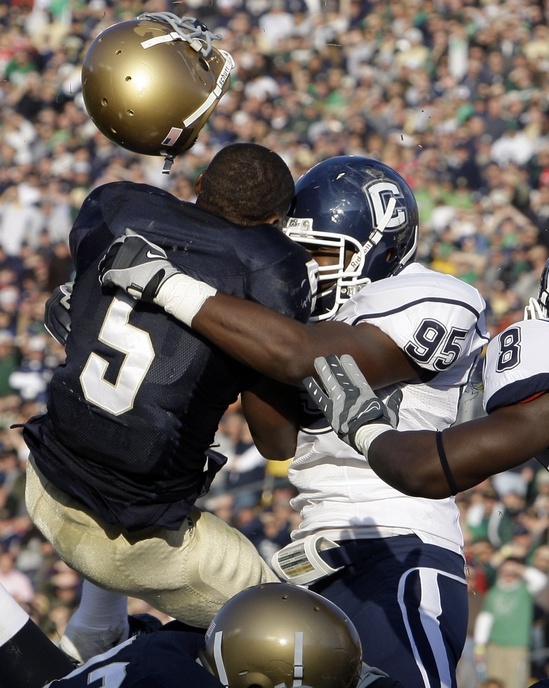 By the way, the inelastic collision pictured above is between Notre Dame running back Armando Allen and UConn middle linebacker Greg Lloyd (son of the former Pittsburgh Steeler of the same name) at the goal line on Saturday. UConn won the game in the second overtime. In college football, each overtime session allows both teams a single possession from the 25-yard line. In the first overtime, both teams scored a touchdown and an extra point. In the second overtime, UConn held ND to a field goal and then scored a touchdown on their turn, thus winning the game. This differs from the professional rule: sudden death. On Sunday, the Patriots beat the Jets in overtime because they won the coin toss and then quickly got close enough to score a field goal. Thus, in the pro game, the coin flip determines the outcome with high probability, a circumstances that rightly causes consternation among fans. Economists have suggested auctioning off possession in overtime, with the currency being the field position from which you are willing to start. At the very least, they ought to use something like the college system. 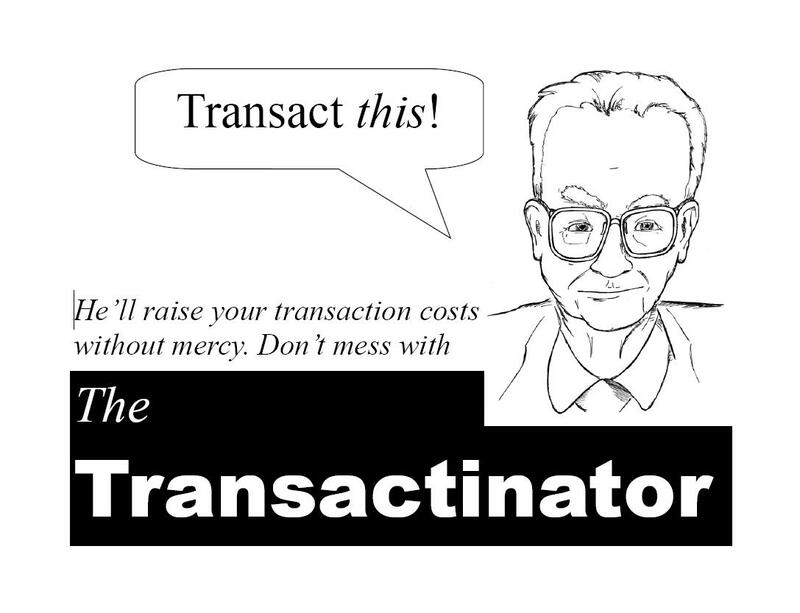 Transaction cost economics (1) eschews intuitive notions of complexity and asks what the dimensions are on which transactions differ that present differential hazards. It further (2) asks what the attributes are on which governance structures differ that have hazard mitigation consequences. And it (3) asks what main purposes are served by economic organization. Because, moreover, contracting takes place over time, transaction cost economics (4) inquires into the intertemporal transformations that contracts and organization undergo. Also, in order to establish better why governance structures differ in discrete structural ways, it (5) asks why one form of organization (e.g., hierarchy) is unable to replicate the mechanisms found to be efficacious in another (e.g., the market). 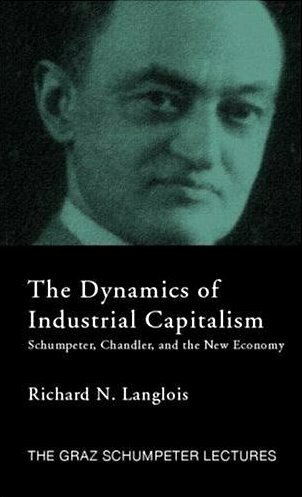 The object is to implement this microanalytic program, this interdisciplinary joinder of law, economics, and organization, in a “modest, slow, molecular, definitive” way.